New, harrowing details continue to emerge about the destruction caused by typhoon Haiyan, which hit the Philippines on Friday. The storm, known locally as "Yolanda," is believed to be one of the strongest storms ever recorded, with winds that reached 195 miles per hour and gusts reached up to 235 miles per hour. On Saturday, deaths attributed to the storm went up to 1,000, but on Sunday, new estimates said that death toll was closer to 10,000 — and maybe even more. Up to 10,000 people may have died in Leyte province alone, according to Tacloban Mayor Alfred Romualdez. "I have not spoken to anyone who has not lost someone, a relative close to them. We are looking for as many as we can," he told CNN. The storm reportedly destroyed 70 to 80 percent of all structures that stood in its path, with poor areas of the Philippines especially hard hit. The strong winds were followed by rising, debris-strewn sea water, is said to have caused most of the deaths. "People are walking like zombies looking for food," Jenny Chu, a medical student, told the Chicago Tribune. "It's like a movie." President Benigno S. Aquino III declared that the country is in "a state of calamity" — a statement that's meant to authorize the release of emergency funds from government coffers. But its not clear how much money remains in the emergency reserves, because the country has been plagued by a series of other disasters this year. Notably, a 7.1 magnitude earthquake caused hundreds of deaths and left many homeless. Instead, the international community has stepped up to help. The U.S. embassy in Manila immediately released funds to help deal with the devastation, though rebuilding all the damage caused by the storm will be a long and laborious effort. 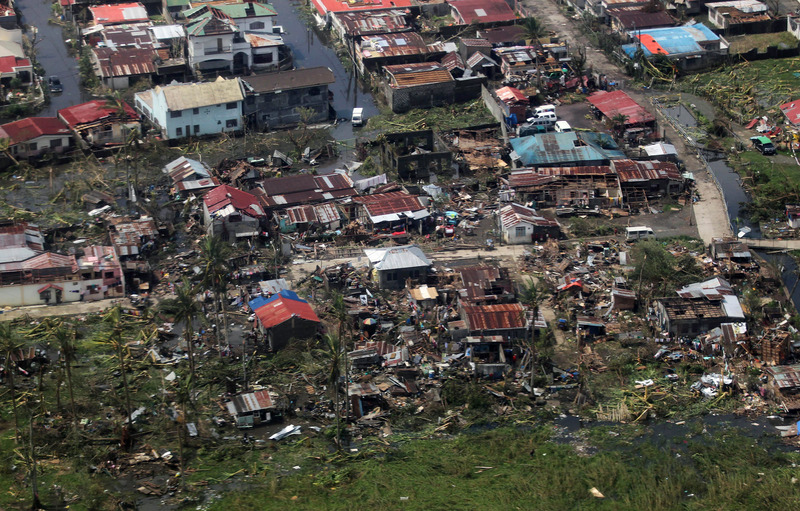 "From a helicopter, you can see the extent of devastation. From the shore and moving a kilometer inland, there are no structures standing. It was like a tsunami," interior secretary Manuel Roxas said. "I don't know how to describe what I saw. It's horrific." To donate to organizations working to help victims of the typhoon, check out the Red Cross, UNICEF, Save the Children, and the World Food Program.